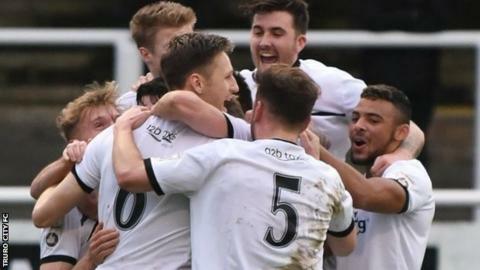 Truro City will strengthen their squad as they face a key period in their season, according to boss Steve Tully. City take on runaway leaders Ebbsfleet United, the first of 15 games between now and the end of February. "We know it's going to be a tough," Tully told BBC Radio Cornwall. "The chairman's backed us and said if we need to strengthen the squad, which I think we will because of the amount of games we've got to play in two months is a lot to ask of the squad." Truro chairman Peter Masters and his board have already been forced to spend £50,000 improving the club's Treyew Road ground, which they will leave at the end of the season. "We'll strengthen the squad in the areas where we need to and I believe by the end of February we'll know where we're at," added Tully, whose side are eighth in National League South, two points off the play-off places. "I firmly believe that come the last few months of the season we'll have something to play for, which will be exciting times for Truro."